Yesterday I threw down a challenge to the Praxis community: 12 Days of Christmas Blogging. Blog every day from the 13th until Christmas. Flex that shipping muscle in the face of holiday obligations and time constraints. Stay on that grind when it is easy to let it slip. I’m playing with fire here because I have to ship, too. Like all good challenges, the blade has to cut both ways in order for it to be any fun. Here is yesterday’s post: How can I come up with more ideas? This reminds me of my favorite Christmas story: Sir Gawain and the Green Knight. The story opens with at King Arthur’s court where he and his men are exchanging gifts and getting ready to feast. A gigantic green figure atop a green horse rides into the court with an axe and a piece of holly. He challenges the court to “a Crystemas Goman” - someone can strike him with his axe and he will return the stroke in a year and a day. 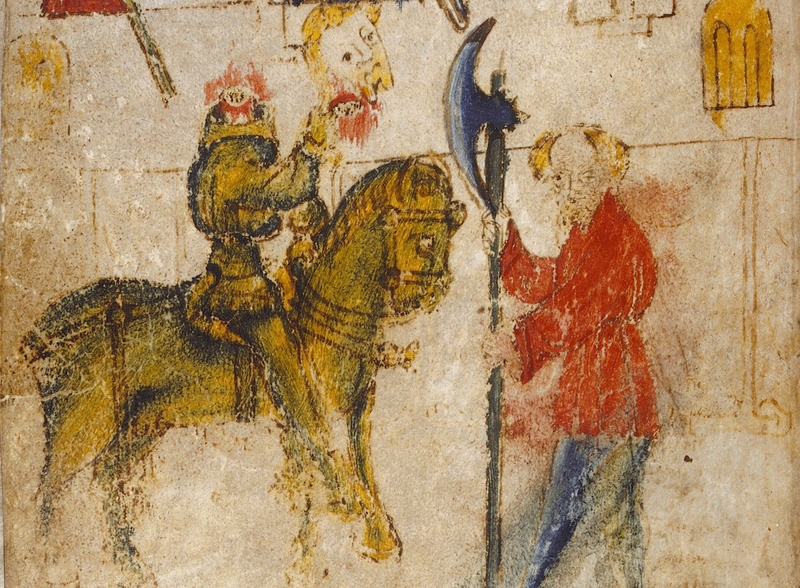 Sir Gawain rises to the challenge and promptly lops off the knight’s head with his own axe. Not missing a beat, the knight picks his head up off of the floor, reminds Sir Gawain that they have date at the Green Chapel in a year and a day, then rides off as abruptly as he arrived. I won’t ruin the rest for you. Give it a read this Christmas! The story teems with vivid, meaningful descriptions, double meanings, alliteration, imagery, and symmetry. It is a wonderful read. To mark the occasion of my own Crystemas Goman, here is a translation I did of my favorite passage. I used Casey Finch’s Complete Works of the Pearl Poet for the text and the Oxford English Dictionary for reference of word meanings. There are about these benches but beardless children. There is no man here to match me, for their strength is weak. For it is Yule and the New Year, and here are many agile fellows. Frayst: (verb) Ask, seek, try, or test. From Fraisten. (a) To seek or search for (something), esp., to seek adventure or combat, go in quest of; (b) to seek or indulge in (worldly things). - I chose “seek” here because each definition had this in common and because “to seek” is an attempt to find something, which captures the uncertainty of the Green Knight barging in to Arthur’s court, even if he were seeking a fight, because he must be uncertain he will find one. Unfortunately, this translation does not preserve the alliteration in the line (frayst, fyȝt, fayth) but I think using the sequence (to seek, fight, on my word) better preserves the meaning, albeit at the sacrifice of some beauty. fyȝt: (verb) to fight, contend. From Fighten: to contend with weapons, engage in armed conflict (en masse or singly), do battle. Or, (noun) hostile engagement, fight, spiritual or moral struggle. - I think “fight” works best here because just a few lines earlier in the poem uses a different word (batayl) which can mean battle or contend, so if the poet wanted to repeat that, he could have. He instead used “fyȝt” (likely to alliterate). Also, “fight” is more personal than “battle.” Since the Green Knight came alone looking for trouble, he would be looking for a fight, not a battle (which implies large groups fighting.) Also, “contend” today means to struggle with something or engage in a competition, which could have been the case for the Green Knight, but I think “fight” fits better with the other words in the line. Finch’s translation throws in “have I come” at the end of this line which does not appear in the ME. While that phrase seems to be implied in the ME, it is not stated, so it does not make a lot of sense to add it in to the translation. Finch seems to add a lot of unnecessary words in this translation. fayth: (noun) belief, religion, word of honor. From Feith. A formal pledge, assurance, or promise. Also, ‘a confidence’ in someone, so it’s both an outward motion and an inward stance. - I chose “on my word” here to reflect the tradition of and emphasis on oral oaths that knights had and to take into account the phrase “I þe telle” at the end of the line. “On my word” conveys the idea of a spoken pledge, which takes into account both “fayth” and “telle.” To give one’s word is a verbal pledge that someone must take in faith. telle: (verb) from Tellen. tell, speak, say, describe, express, utter, report - See explanation for “fayth” above. Hit: it, there, etc. - Paired with “arn” it is appropriate to translate this as “there are” since the line is about all of the men (plural) on the benches. Bot: but, only quite, except; Alternate definition: a parasite affecting the skin. - I chose “but” here as it seems the most likely translation for “bot” and it alliterates with “benches” and “beardless.” I found it interesting, though, that “bot” is also a skin parasite. It is possible, if this parasite was common, the Pearl poet could have a little laugh at the idea of beardless youth/puny men being parasites upon Arthur’s benches. I think it is unlikely that this is the first meaning of the line, but it is interesting nevertheless. “But” better fits the idea that the only men around Arthur’s bench are “berdlez chylder” and the Green Knight is poking fun at them. Berdlez: (adj) Without a beard, beardless, not having reached manhood, underage. - “Beardless” is both alliterative and a concise way to call out Arthur’s men as being puny and not worthy to fight a real man like the Green Knight. Calling a man beardless is a pretty good jab at him. It implies - “You must not be a man because you can’t grow a beard.” This leads to the next word. Chylder: (noun) youth, child, a youth of noble birth, esp. an aspirant to knighthood - The Green Knight does not actually mean there are children sitting around Arthur’s table. He is poking fun at the strength and size of the men. They are all likely around the Green Knight’s physical age, but he is saying he is stronger than they are and they are not worthy to be called men. Using “children” here is more of a jab in modern language at the men around the table than calling them “youth.” Calling a losing football team “youths” will get you yelled at. Calling them “children” will probably get you beat up. When the Green Knight says these first two lines, he is basically saying he is not seeking a fight because there are only little boys here, not men worthy enough to fight him. Hasped: (verb) from Haspen: To fasten (a door) shut; to fasten (a helmet), buckle or lace; to wrap (oneself) in a garment; enclose (in armor, clothing); to embrace (someone’s neck), clasp. - Taken together with “in armes” I translated this as “fastened in armor” because being wrapped or enclosed in armor does not make much sense. A warrior or knight fastens his armor in preparation for a fight to make sure it does not fall off. Heȝe: (adj) high, lofty, noble, excellent, tall, great. - “noble” - See explanation for “stede” below. Stede: A splendid, noble, spirited horse; a riding horse, a steed; (b) a war horse, charger; - I preserved what this word becomes in modern language, “steed.” Paired with the previous word, I translated this to “noble steed.” The Green Knight is a big, powerful knight and thus should be paired with a large, noble steed on which to pursue glory. The word “noble” encompasses high, tall, and lofty in itself, so I think it appropriate. Note: This line is somewhat factious because the Green Knight just charged into the room on his massive steed in his armor. The “were I” is a conditional and a roundabout way to say that he can beat anyone in the room. Since he is in armor on his steed, he is saying that no one in the room is as powerful as he is. Also, a note on Finch’s translation: “on a heȝe stede” does not really match up to “warlike on steed.” Heȝe refers to the steed, not the Green Knight. Finch takes a lot of liberty with this line. Mach: (verb) from macchen: To be an adequate opponent for, equal; be equal to, to match. Or: To marry; to become familiar with; to be paired with, work for, serve. Or: To fight, oppose, attack; also, to attack and overcome. - I chose “to match” here, but with the different definitions it could go multiple ways. Referring back to a hypothetical fight, “to match” works well here because it can mean an opponent that the Green Knight is paired with or that there is literally no one in the court to match the Green Knight’s skill and strength. The word play is interesting here, though: the “work for,” or “serve” can mean that there is no one in the court that the Green Knight would even let work for or serve him. Basically, the idea I tried to capture is that there is no one in this court, by the Green Knight’s opinion, as great as he is. Myȝtez: from myȝt: might, can, may, will. Or: physical energy, vitality, vigor; exhausted, unconscious; very vigorous; physical strength. - I chose “strength” here because, paired with “so wayke,” “may” does not make sense and the idea of “feeble physical energy” is not very appealing. The idea that no one can match the Green Knight because their strength is so weak makes a lot more sense and fits in with the storyline. Also, see part of the explanation for “wayke.” The potential word play here is interesting, though, if “exhausted” or “unconscious” is taken to be the translation of myȝtez, because we get the line to mean something like: “There is no man here to match me, for they will be exhausted because they are so weak.” It adds a little different meaning. I think “strength” here fits better, though, because the Green Knight is continuing his jabs at them by calling their strength weak. Wayke: (adj) Weak, feeble. Of combative strength: ineffectual; deficient in bodily or muscular strength - I picked “weak” as it has the connotation of the rest of the possible definitions. “Deficient bodily or muscular strength simply means “weak” in modern usage. (This also strengthens the case for using myȝtez to mean “strength.”) Calling someone’s strength weak in modern language has a little more of a sting to it than calling their strength feeble or ineffectual. See part of the explanation above. Note: Finch’s translation of this previous line is intriguing, especially since he takes the last part to mean: “though mighty and sure.” The mighty part works well, but nowhere did I find wayke to mean “sure” - Finch in the back does not even translate it that way. In the back, it is translated similarly to above. Gomen: game, festivity, revelry; a pastime, amusement; or joy, happiness. - I chose “game”here for the mystery associated with “Christmas game” that gets the reader wondering what this game is. There is wordplay going on, however. Should we take gomen to mean festivity or revelry, we get a different meaning because Christmas festivities and revelries are exactly what is going on at the court. Of course, when we read ahead, we understand that he is looking for more than revelries, but a game which he will spell out. If we take gomen to mean joy, we get yet another meaning, especially if we choose craue to be desire and gomen to mean joy. In this case, the Green Knight would have came to the court desiring Christmas joy, which could be a number of things. Again, if we read ahead and find out what he is really looking for, the “Christmas joy” must be a very strange notion of joy. I think game fits best. Ȝep: Physically agile, skilled at a physical activity, adroit; nimble, active, quick; vigorous, lively; also, youthful in appearance or manner Or: Mentally agile, sharp-witted, astute, clever; also, as noun: clever fellows; full of stratagems, wily; also, full of sleights, crafty, cunning - I chose “agile” here to preserve the poet’s open-ended meaning. Agile can refer to either mentally or physically agile - we will only know when the Green Knight reveals the game. (When he does, we realize it is a sense of both.) For either mental or physical, agile covers the other possible ways of translating this word. There is also a word play going on here with relating the mental or physical agility of the men to the season. A new year is seen to be lively, vigorous, and agile. Also, strangely, the poet says in this line that there are agile or lively men in this court, right after he pokes fun at them for being “berdlez chylder.” I haven’t quite figured out what to make of this except that he is possibly tempting them into his “game” with this statement. Mony: many, many a one; Or money; Or moon. - I was unsure about this word because I could not find a clear definition of it. There are a number of words in the MED that looked like they could work, but none of them made sense in the context (like money or moon.) I just settled on many because that is what the reference in the back of Finch used and it works well with the the idea that there are many agile fellows in Arthur’s hall. I suppose the translation could be something like “and here is cunning money” but I am not sure that fits in the poem. Hardy: (adj) Physically tough, hardy, enduring, brave, bold; of actions, faith: requiring resolution or courage, firm, fierce; Or: Audacious, presumptuous, rash, foolhardy - I translated this as “hardy” - the same as in ME, because it preserves the open-ended meaning of the word. The word play here is interesting… it could mean bold, tough, brave, or firm on one hand, or presumptious and rash on the other hand. Of course, these seemly different meanings go hand in hand–pride is a double-edged sword. Hous: (noun) house, building, hall, etc. Or a covering for the back and flanks of a horse, horsecloth; also, a saddle cloth; a protective covering, case, sheath; - I translated this as “hall” since these scene takes place in Arthur’s hall. Also, I wanted to preserve alliteration here: (hall holds himself hardy.) Another possible meaning emerges if we takes this as either a protective covering or a saddle cloth: the Green Knight could be poking fun at the men that act bold when protected from blows by armor or when they sit high on a horse, but would get defeated easily. Holdez: holds, claims, thinks, views. - I chose “holds” for holdez in order to preserve the alliteration in this line. Changing from holds to claims, thinks, or views has a slight change in meaning, but nothing of depth. Since these have close to the same meaning in the context of the line, I chose the one that alliterates the best to preserve the alliteration from the ME. Bolde: bold, valiant, daring. Of persons: brave, courageous, daring, fearless. Or: overconfident, forward, rash; brazen, presumptuous, shameless, impudent; - I chose “bold” here because bold has multiple meanings in modern language, just as it does in ME. Again, there is good word play here with the line between boldness and overconfidence. Blod: blood, emotion, anger, passion, (sexual) desire; courage, mettle, spirit; temperament, nature; Or: A living being, a creature, a person. - I chose “blood” here for two reasons: alliteration with bold and one of its modern meanings: temperament or disposition. We can choose any of these words and get the line to mean something slightly different, but having a bold temperament pretty much covers most of these. The poet could be pulling in a critique of knights under the rug if he had in mind that bolde in blod could mean bold or shameless in sexual desire. Note: It is important to keep in mind that tweaking any of the words in a line could give the line a different meaning every time. Since each of these words in ME has multiple meanings, the meaning of each line (not to mention how each line interacts with each other line) starts to cover a wide range very quickly. Dar: (verb) dare, to have the courage to, to be able to, or shrink, cower, bow down, submit. - I chose “dare” here to portray the idea that someone might be mad enough to have the courage (read: dare) to take the Green Knight up on his offer. The interesting possible word play here is that instead of dare, one might be mad enough to “bow down,” “shrink,” or “submit” to the Green Knight’s game. This could be pointing back to the beginning of the Green Knight’s monologue where he makes fun of the men for being weak. He could be suggesting that if they give in to his game they are weak in yet another way and can be easily manipulated. Strok: (noun) A stroke, a blow delivered with a weapon; a slash, cut; a thrust or stab - I chose “stroke” here because a stroke is just one swing, which preserves the rules of the Green Knight’s game–one stroke for another. Anoþer: another, a second. - Though there is not much here, I think choosing “another” over “a second” needs an explanation. One strike for another gives conveys the idea of that “another” being a reciprocal strike rather than a second strike from the hand that struck first. Though “a second” would have added to the alliteration, I don’t think the meaning was clear enough to warrant using it. Schal: (verb) shall, will, must. - I chose “shall” here because the meaning of shall in modern language expresses a strong assertion. The Green Knight is giving his word (back again to the importance of oaths) and will not break it. This is a theme in the rest of the poem. Giserne: A long-shafted battle ax or halberd with a knife-like point rising from the blade – or the gizzard of a fowl; the liver of a fowl or a hare; the entrails of a fowl. - I chose guisarme here because that is the modern word for the weapon the Green Knight had and gives the reader a definite idea of what it is. If giserne did, in fact, also mean the entrails of a fowl, then this line has comical undertones–the Green Knight giving one of Arthur’s men gizzards as a gift. It is almost certain the GK meant his axe, but the potential double meaning is comical. Ryche: (adj) rich, splendid, ornate, fine, noble, costly, precious, well-wrought, well-made. - I chose “well-wrought” here because it assumes and subsumes the other adjectives I found for ryche. Heué: heavy, serious, grievous. - I chose “heavy” here as I wanted to put the emphasis on the axe’s weight (see explanation for innogh below.) The poet had word play going on here, though, because the two other definitions for heué give the line different meanings. A serious or a grievous axe have darker, more chilling undertones than a heavy one. This possibly forebodes what might happen later in the poem. Innogh: (adj or adv) enough, plentiful, generous, abundant, great, very. - I chose “plenty” here because not only is the Green Knight expressing the weight of the axe, but he is making another statement here as well. Earlier he said it is “noble” or “well-wrought.” The weight of it could be a sign of its authenticity. “Plenty” is the Green Knight’s way of assuring the men that it is indeed well-wrought and its weight alone might be sufficient to display that. Hondele: (noun) A handle of a container, implement, etc. ; a grip or hilt of a sword. Schal: (verb) shall, will, must. - Again, I chose “shall” here because the meaning of shall in modern language expresses a strong assertion. The Green Knight is sure he will endure the blow and he is making a promise to his hosts that this is the case. Bide: (verb) remain, wait, stay, endure; from Biden: to experience or undergo (sth. ); to suffer or bear (hardship, etc. ); to enjoy - I chose “endure” here to express the idea that not only will the Green Knight take the blow, but he will patiently take it, he will not be harmed by it, and he will wait a while year before he retaliates (as we find out a few lines later.) To change “endure” to suffer or bear would be to irretrievably lose some of this meaning. Bur: (noun) from burre: onslaught, blow, force, or strike. - I chose “blow” for alliterative purposes. Bare: (adj) bare, naked, without armor, unprotected, or open. Also, unadorned, unornamented; simple, plain, crude, laid waste, destitute, or poor. - I chose to keep this as “bare” because it portrays the idea that the Green Knight is not going to have extra protection, pull any tricks, or try to defend himself. Bare can mean without armor and unprotected, but also open, which helps the idea that he will not protect himself. He will be under the axe just as Arthur’s men see him.